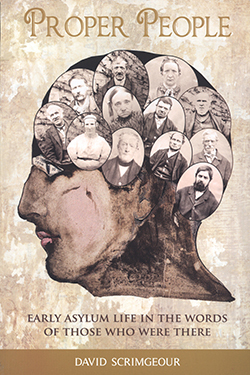 This text is essential reading for anyone interested in the history of psychiatric care. Told via extant written accounts of patient’s experiences, it covers the period 1818 to 1869, taking us through the biographies of mentally ill patients in Yorkshire’s West Riding Pauper Lunatic Asylum in Wakefield. By means of an exhaustive survey of myriad sources – case files, chaplain’s journals and discharge books, not to mention council archives and medical museums – the narrative takes us deeply into the world of the hospitalised 19th Century patient and those who attended them. Pages 149-152 tell of Mary Tinker, a 37-year-old housewife admitted in 1843: ‘wild, rude and unceremonious’, she was also ‘noisy, abusive and violent’. Discharged in 1845 she is re-admitted in 1846. From 1848, there is a 14-year gap in her notes and although, by 1875, there is recorded ‘little change’, she at least is reconciled to her hospital domestic work routine. Finally discharged in 1877, after 32 years of asylum care, we see Mary’s photograph: featureless, but for her pale skin and her dark, accusative eyes. Well-illustrated and happily lacking authorial sentimentality or moralising, I heartily recommend this highly accessible, magisterial, investigation into our asylum past.